In previous travels, I have always known a little, or a lot, about the musical histories of the countries I was visiting. I believe it is important to have some understanding of the social, cultural, and political histories of a country before one visits, and as a musician I have also always been interested in the artistic output. Unfortunately, before coming to Thailand I knew little about it’s musical history. Add to that a depressingly derivative and inescapable pop/rock/hip hop scene and I had a real thirst for some quality Thai music. I knew it was there, but where . 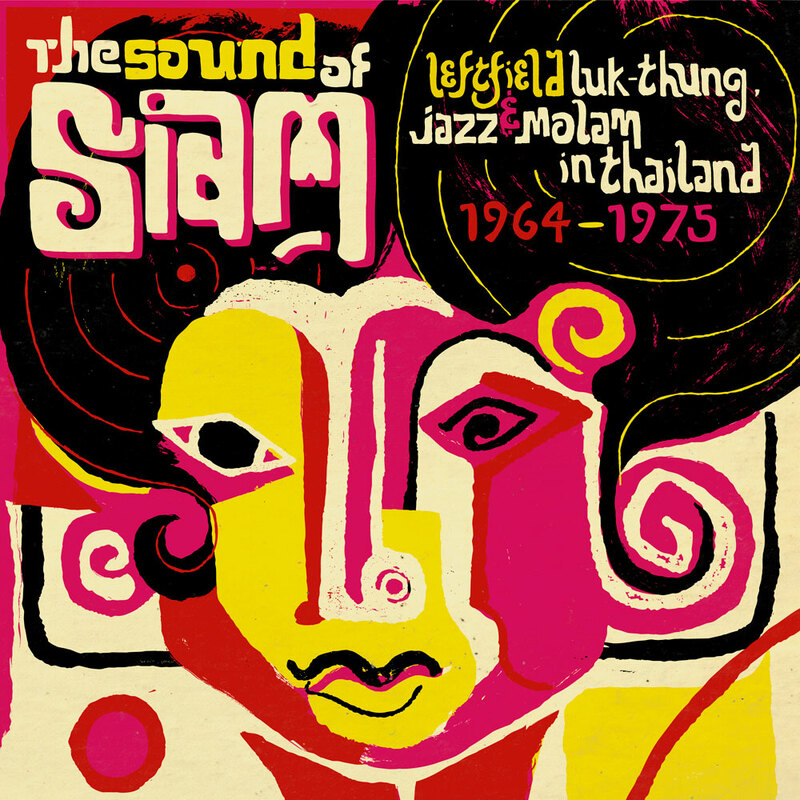 . .
Then I came across ZudRangMa Records and the collection The Sound of Siam: Leftfield Luk Thung, Jazz & Molam in Thailand. 1964 – 1975. 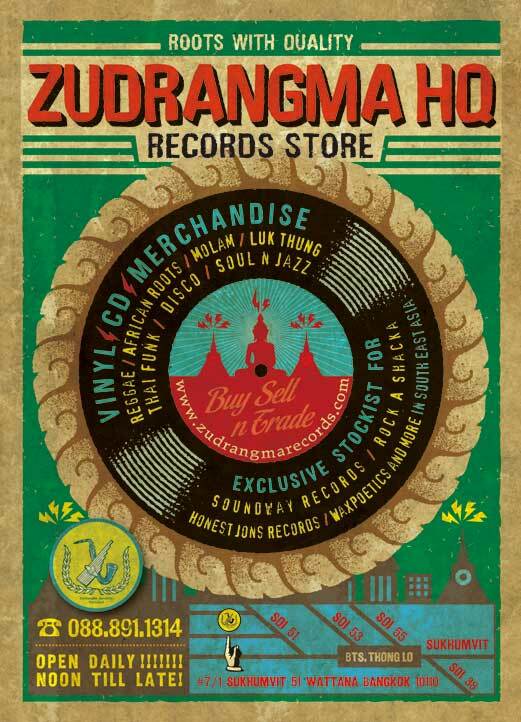 ZudRangMa is a small, mostly vinyl collectors record shop in Thonglor. The store is run by Maft Sai and Chris Menist, Bangkok based DJs and cratediggers that also put together The Sound of Siam compilation. This is a great introduction to some incredibly soulful music, mostly coming from Isaan migrants to Bangkok. Along with love lost, many of these songs speak to the often difficult transition from life in farming communities in the northeast, to the struggle to find work here in the capital. You can also check out the diverse mixes of Maft and Chris at their frequent “Paradise Bangkok” DJ sets around Bangkok, and growing excursions worldwide. They play old school Thai music alongside African, Caribbean, and Middle Eastern grooves, properly situating Thai music in a high point of 1960s/70s political and artistic cross-pollination and experimentalism. I’m sure there are some good musicians making interesting rock music, and rappers with deep beats and something to say, but until I find them this soul from the past will more than do. This entry was posted in Music and tagged jazz, luk thung, molam, record store, thai funk, thai music, zudrangma by blackthai. Bookmark the permalink. This is interesting to hear about. I wondered if there might be “accessible” local music that was not simply derived and contrived from Western sound. I had given up on trying to find anything as the lack of language, cultural understanding, and ultimately limited sensitivity to a traditional sound would make it a short lived foray into the realm of Thai music. I thought enough cab radios would suffice. I agree music and art in general is mostly a reflection on current circumstances, although modern technology and mass media have created an artificial representation of lived lives and even enabled individuals to do he same. What naturally follows is superficial, inauthentic art mirroring those lives. The 60’s/70’s was a particular time of great social/political affect across much of the globe. In my opinion, some of our greatest music (if not the in the Americas), has come from that period. I haven’t heard the music, but I ask aside from the thematic content, how is this musically different from other derivative forms you mentioned? I would say that Bossa Nova, Afrobeat, Reggae all were influenced and infused with jazz and/or R&B, but what resulted was something of its own. Can the same be said for this Thai music? I am no expert in the historical roots and development of Thai musical forms, but I beleive the music mentioned here is genuinely “Thai.” While there are no doubt transnational and transcultural influences happening, much of that based on the popularity of American Soul and R&B, I think there is also an attachment to syncopation and bass that seems to be expressed more deeply in African, Asian, and many indigenous cultures outside of Europe. Perhaps this also lends to these resonances in the 60s/70s? I agree there are reciprocal influences between the East and West. I’m not a music historian, but I would think the difference is that in the U.S., Eastern sounds were incorporated into established musical genres, whereas the above mentioned African, Latin, Carribean genres were newly created combining the influences of American music: Blues, Jazz, Soul, R&B, with traditional African rythms. That being said I would think we can find the roots of all black music in African drums. That is well documented in the West. I am interested in how far East those influences have/had spread.